It must be said that Gorleston is a fairly non-descript kind of place, straggling along the A12 south of Great Yarmouth's Southtown. To all intents and purposes Gorleston is a suburb of Yarmouth, yet on this bright and breezy day, with the shoppers thronging the busy and surprisingly hilly High Street, it felt as if it had a life of its own, and I liked it for that. It may surprise you to learn that Gorleston is Norfolk's fifth largest town after Norwich, Yarmouth, Lynn and Thetford. I wonder how many people would think of it if asked to name the county's larger settlements? Until the 19th Century, Gorleston was in Suffolk, as was Great Yarmouth's Southtown. The border was the River Yare, and one likes to imagine the respective natives eying each other warily across the water. I came here on the day of the Historic Churches bike ride of 2010, and I was disappointed to find that I had arrived at the Anglican parish church just as a wedding was starting. There was another wedding due to take place at 2 o'clock, but the nice lady signing in cyclists in the adjacent church rooms said that if I came back in an hour I would have the church to myself for a while. An hour seemed a long time to wait, especially on the bike ride day, but as it turned out it would take me nearly that long to visit Gorleston's other churches, and I came back just as the bride and groom were emerging from the south doorway to begin their new life together. This is a big church, with long aisles which extend right to the east end of the chancel and a grand tower. But there is no clerestory, and the overall impression is of a lazy animal sprawling on a raised green cushion overlooking the town centre. The octagonal parish rooms to the north must have looked the very thing in the early 1970s, but the structure seems not to have aged well, the shingle walls more familiar from public toilets and the green roof now looking a bit shabby. However, walking over to the church and stepping into the north aisle I found myself in a bright, warm open space, its width accentuated by the lack of height. Gorleston's parish church has one of East Anglia's thirty-odd seven sacrament fonts, those great treasures of England's late Catholic period, although I fear that this one is more vandalised than almost any of the others. Fonts seem generally to have been plastered over in the late 1540s, and much has survived elsewhere. Perhaps parts of this one had to be knocked off to make it flush, or perhaps the protestantism of this parish was more extreme than elsewhere. Whatever, this font was the subject of one of the 19th Century's great ecclesiological spoofs. A man called William Elsom Randall, who seems to have been something of a local eccentric, forged and published a diary entry which was supposed to have been written by the great Suffolk iconoclast William Dowsing some two hundred years earlier. Randall was a well-known and extremely competent forger. He had already published an account of his 'discovery' and 'excavation' of druidical stone circles in the Gorleston area in archaeological journals. The historian Dr John Blatchly, in the 2001 edition of Dowsing's Journals, notes that Randall's personal papers extend to more than 1,400 works, and they take a great deal of wading through, because Randall was endlessly repetitive; he seems to have been in the grip of an obsession to make much of little (or nothing) about the parish of his birth. Randall would have known Dowsing's journal well, for parts of it were at the time being republished and discussed in historical magazines. 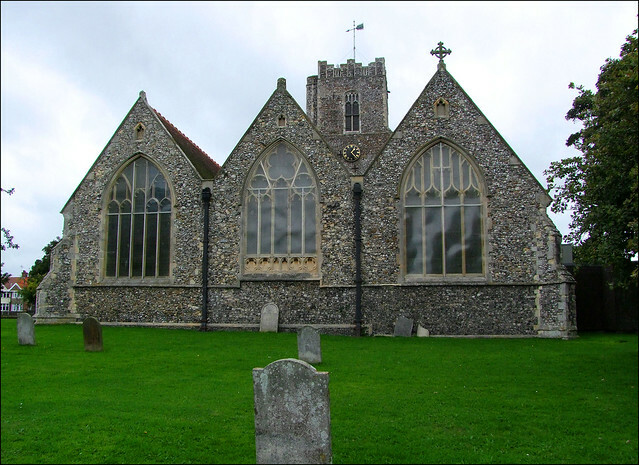 William Dowsing was a Suffolk puritan who, in the year 1644, made a progress through about 250 churches in Suffolk and Cambridgeshire on behalf of the Earl of Manchester, overseer of the Eastern Counties. Dowsing was looking for imagery which suggested Catholic practice, and which had not been removed by the reformers of a century earlier. This was generally that which the earlier reformers would have found difficult or expensive to replace, like stained glass, or that which was not easily accessible, like roof angels and gable crosses. Interestingly, much of what Dowsing destroyed was not medieval at all. Rather, it was the evidence of the sacramental enthusiasm of Archbishop Laud, who had installed altar rails and raised steps in chancels in the 1630s. The damage Dowsing caused was considerable, although nowhere as bad as that perpetrated by the Anglicans of a century earlier. However, his name is synonymous with iconoclasm simply because he kept a finely detailed diary of what he saw, and what he destroyed. It is to be remembered that Dowsing was welcomed, and probably invited, almost everywhere he went, and there is a certain honesty about his work. He was not pragmatic; it was not part of his plan to save the local parish trouble or money in replacing glass, but neither was he interested in feathering his own bed. The Anglican reformers of the 1540s had been guilty of this, but Dowsing's mission was one of religious zeal. Another curious aspect of his progress through the county is what survived him. Some beautiful art objects, including seven sacrament fonts, did not incur his wrath. Neither did glorious bench ends. We know that Dowsing visited churches with seven sacrament fonts, and yet he does not mention them. This did not put Randall off, however. He forged an extensive account of a visit to Gorleston parish church by William Dowsing in the style of the other entries in Dowsing's record of his visits. He did it by culling no fewer than thirty-five phrases from entries in the Journal, and then putting them together into an order to create a false account of Dowsing's destruction of several pre-Reformation features at Gorleston church, most notably the seven sacrament font. Randall's forgery was published in CJ Palmer's History of Great Yarmouth in 1856, and then most damagingly of all was included in White's 1880s edition of Dowsing's Journal, the standard edition until the first year of the 21st Century. But Dowsing never came to Gorleston, and the forgery was exposed as long ago as 1906 by no less a figure than MR James, the antiquarian, provost of Kings College, Cambridge, and writer of ghost stories. Unfortunately, it continues to be quoted as the truth a century on. Randall's forgery is included in Mortlock's Guide to Norfolk Churches, where it is quoted at some length as if it were genuine, and also in Nikolaus Pevsner's The Buildings of England: Norfolk 1, the 1997 revision by Bill Wilson blaming Dowsing for something which he really did not do. But this is still one of the most mutilated of the series, and a reading of it is difficult. The panels show Christ in Judgement (E), Last Rites (NE), Penance (the penitent kneels at a prayer desk, N), Eucharist (similar to the famous panel at Westhall in Suffolk, NW), Confirmation (W), Baptism (SW), Matrimony (S) and Holy Orders (SE). The font sits in a sea of 19th Century tiles which spread away in all directions. This is an urban church, of course, and as such was always more likely than its rural cousins to suffer an extensive Victorianisation. Having said that, it remains a characterful and interesting interior, the chancel suitably grand and the whole piece having a gravitas worthy of a great urban building. The glass in the aisles, by the Mayer & Co workshop, is generally not good, although there is a very fine Ward & Hughes window of Christ summoning the Disciples at the west end of the north aisle, and the great window in the east end of the south aisle contains outstanding glass of the mid-20th Century - is it by Christopher Webb, I wonder? The Caroline Royal Arms are in a glass case at the west end of the south aisle, and this aisle also contains several brasses to the Bacon family. In the north aisle there is a huge Easter sepulchre which has been reset and pressed into use as the entrance to the aforementioned parish rooms extension, an idea which Pevsner described as a bold if slightly shocking idea. I liked the memorials to former choirboys killed out in the Empire or in WWI. The church was beginning to fill up for the next wedding by now, and so I stepped outside and took a wander around the wide graveyard. The headstones have been reset most curiously by the lawnmower enthusiasts, evenly spaced about ten feet away from each other, as if they were on punishment parade and were not allowed to talk to each other. Several of them appear to have interesting masonic crests. I couldn't help noticing the large numbers of parasol fungi, that most delicious of common mushroms, growing here, but I was on my bike and had miles to go. The church is a splendid sight from the east, even if the aspect is somewhat spoilt by the perspex guards on the windows - can they really be necessary? As the bells rang out in their splendidly English way, St Andrew felt thoroughly integrated into its town on this September day, and I warmed to both even more.